Arkansas’ best breakfast spots range from high concept to good old-fashioned grub. 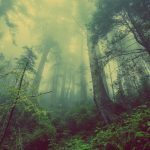 Here’s where you can get your morning bite all over the state. 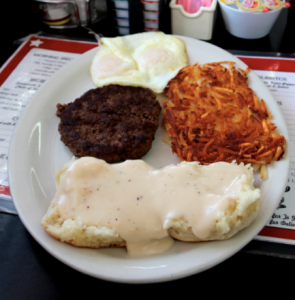 This 24-hour diner has “GOT” it all – as in, it offers Gravy On Top of so many breakfast items, including the GOTcha – an open-faced biscuit topped with hashbrowns, eggs and choice of meat smothered in gravy. 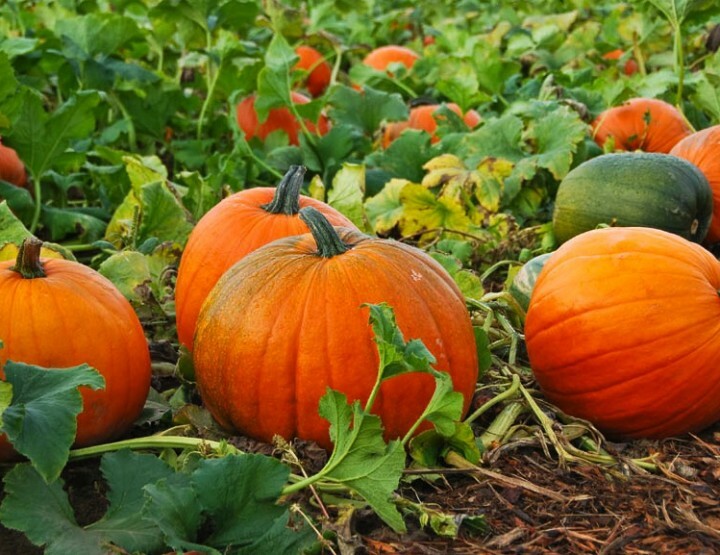 It’s the sweet potato pancakes, though, that draw the most attention. Humble but steady and ridiculously cheap. 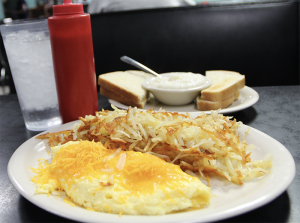 The star of the menu is the Full Moon – an omelet where ham, bacon, sausage, tomatoes, onions, and peppers are beaten together with egg before being cooked and folded over a cheese filling, served with hash browns and toast or biscuits with gravy. 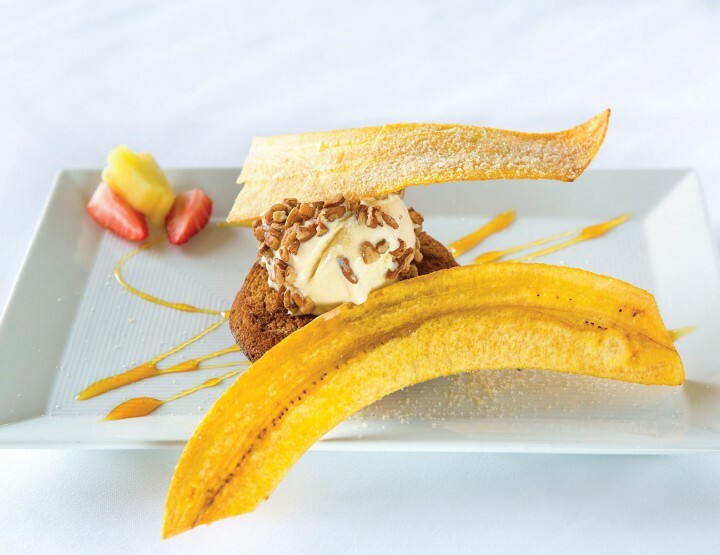 A bright new local-heavy menu with a plethora of choices to satisfy any diner, with a wide array of omelets, pancakes, biscuits and signature dishes such as the exemplary shrimp and grits. The honey marmalade butter is not to be missed. 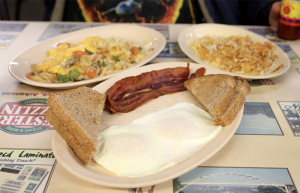 Few restaurants achieve the country breakfast standard of this Fort Smith mainstay, which offers eaters breakfasts based on the number of items they choose. 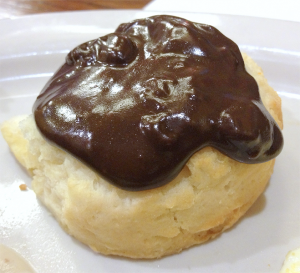 Breakfast steak, ham, grits and even chocolate gravy on biscuits are all available – and as with every meal served at Calico County, there’s a hot cinnamon roll delivered to the table before you order. 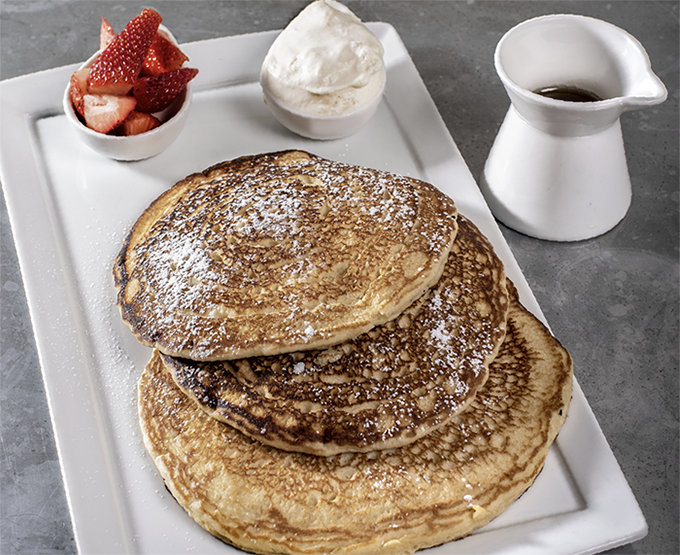 Oversized pancakes, loaded hashbrown skillets, oatmeal, cinnamon rolls – everything on the menu comes to the table hot, quick, and cheap. There’s no item on the breakfast menu over $8, and this is the best place in town to catch up on local goings-on. Gourmet doughnuts are nothing to sneeze at – but the real stars of the menu at this upstart East Village dinette are at the intersection of sweet and savory, like with the pulled pork and egg on a doughnut, or fried chicken and egg biscuits smothered in gravy. 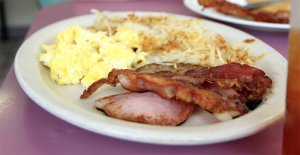 The original country diner experience that dates back to 1953 – this is where to get your day started with a plate of pork chops and eggs, grits and gravy, complete with coffee and juice. 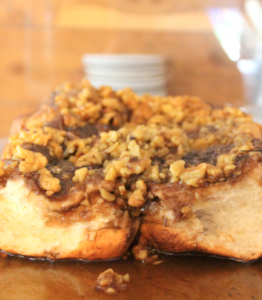 It’s also where you’ll find that old kitchen table classic, cinnamon toast, on the menu. 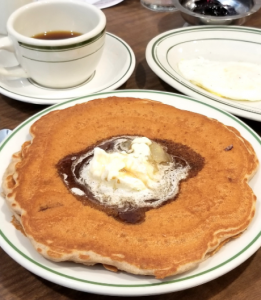 The capital city’s longest-running breakfast-focused restaurant continues to please with its famed Nest Egg of three eggs scrambled with vegetables atop a pita, covered with cheese, black olives and sour cream. 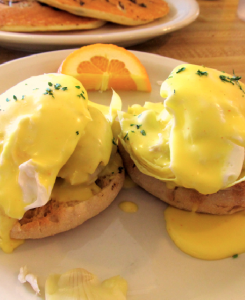 It’s the delectably light Eggs Temptation, a split English muffin topped with crab, asparagus and Hollandaise, that keeps winning hearts. 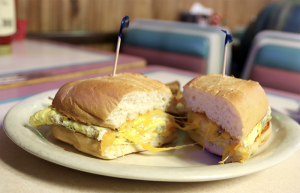 You’d be hard-pressed to find a breakfast spot in East Arkansas busier than Greg & Jim’s, tucked between Forrest City and Wynne on Highway 1. 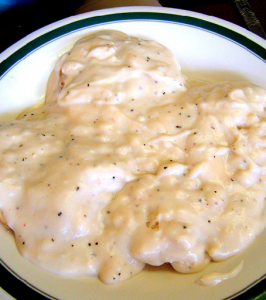 Crowds gather before the sun rises to start their day with the restaurant’s famed Big Poppa – two open-faced biscuits topped with four sausages, eggs, tater tors and gravy – or the country ham plate – 16 oz. 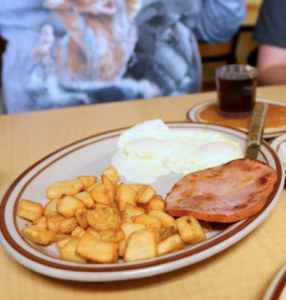 of country ham, eggs and hashbrowns. 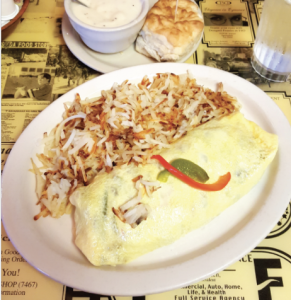 Delightfully light pancakes and waffles and the popular “Bean Boy” omelet of vegetables and peppers are sought by locals and lots of travelers who make the run over from Greenville, Mississippi. Try a breakfast sandwich on toast. 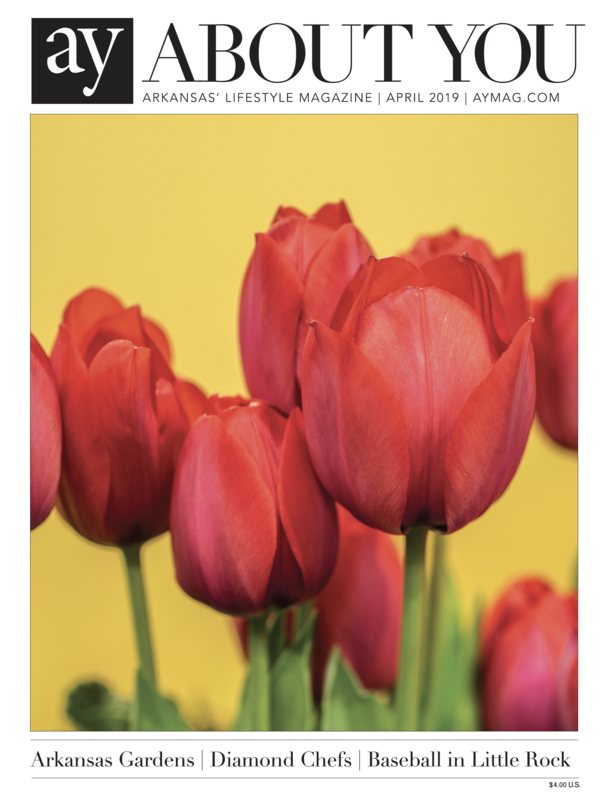 Ribeye steaks, tri-fold omelets, country ham – they are all good at this Lower Arkansas hotspot. If you have a little extra time, kick back and enjoy one of the restaurant’s dozen different Belgian waffles, with a number of combinations of fruit, cream, chocolate and caramel. 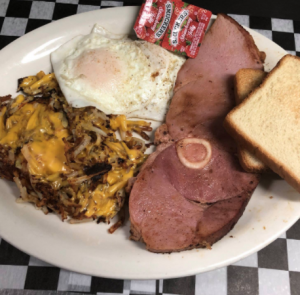 Housed in a former Waffle House, this diner has all the meats, especially in the Big Kountry Breakfast, which features ham, sausage and bacon alongside eggs, hashbrowns and biscuits with your choice of cream or chocolate gravy. 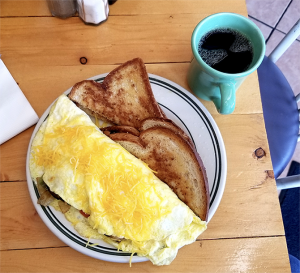 The tiny building that’s housed a gas station and a barbecue joint in its previous life sports all of four tiny tables within, but its fantastic Greek omelet full of gyro meat and cheese is one of Hillcrest’s greatest morning-time gifts. 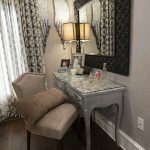 The fresh beautifully presented brunch-style fare will have you lingering over your coffee and savoring your repast. Try the marvelous Mexican Scram, eggs packed into a roasted poblano pepper with cheese, black beans, salsa and fresh sliced avocado, or go with cold smoked salmon with capers. 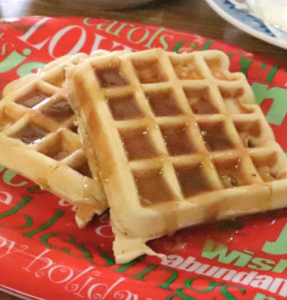 The gingerbread waffle is another favorite. Brunch is only available from 9 am to 3 pm on Sundays. This classic retro diner offers huge breakfasts, including an array of unique omelets, such as a chili-cheese omelet and a cheeseburger omelet. Be sure to ask if it’s free pie day for a slice to go along with your grits. Just like having breakfast at home. Customers share tables and select from pancakes, waffles, breakfast tacos and whatever Lisa has in mind for the day. The soda-light waffles are brought to the table with butter heated in the syrup, and everything’s served on seasonal plates. Classic roadside eateries of the 1950s are remembered here at this bright red and yellow diner on the business route through town. Smothered spuds (hashbrowns sautéed with peppers, onions, bacon, sausage and ham) and four-part breakfasts with hunks of hamburger steak and gravy-drowned biscuits are filling fare. 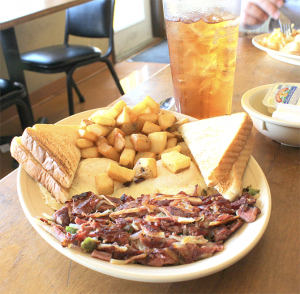 Since 1947, this classic modular eatery has all sorts of local favorites, from a Petit Jean ham platter to Kansas City steak and eggs, fried bologna and corned beef hash, breakfast burritos and the Pan San, a plate of small pancakes with eggs and sausage links. 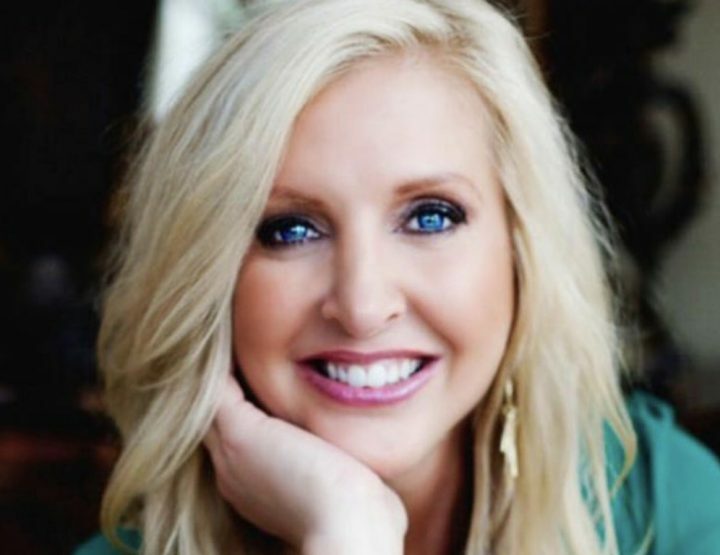 The menu changes seasonally, but it’s a good bet you’ll find excellent choices such as the Irish Breakfast (eggs served over cheddar bacon War Eagle mill grits), and the banana stuffed French toast any time you go. 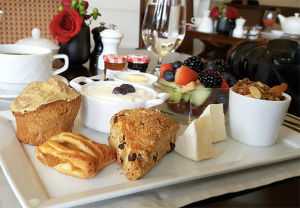 The Petit DeJeuner de Paris is a marvelous array of cold dishes, such as yogurt with granola, fresh fruit, freshly baked croissant and various fruit bread and hand-selected cheeses. Wonderful. Ever heard of the Omwich? 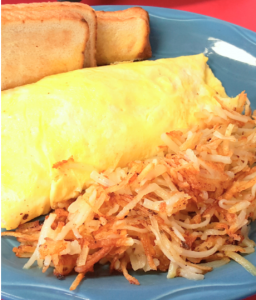 This singular specialty is an omelet packed with your choice of meats, cheese or fungi, served on a soft hoagie roll with your choice of potato. Breaded pork tenderloin, KC steak, liver and onions, and even a veggie patty are options on the two-egg breakfast, and jelly and cottage cheese are optional omelet fillings. 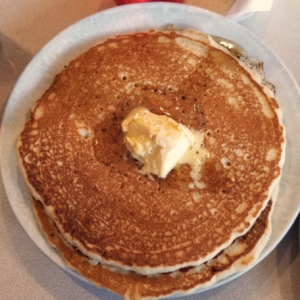 Monkey chip, orange swirl, milk and cereal, cinnamon and bacon, white chocolate – this tucked-out-of-the-way breakfast specialty shop is the place to go for novelty pancakes in the region. 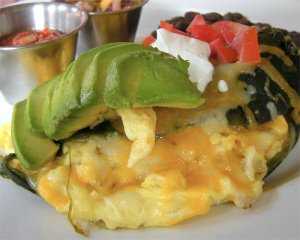 Plus, it offers the most gorgeous plate of Huevos Rancheros you’ve ever seen. Croissant French toast? Chicken and waffles? 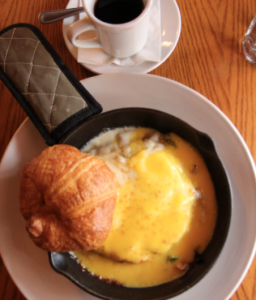 Praised for its dinners, Red Door should not be overlooked for its delightful breakfasts, especially its breakfast skillets like the French Country Breakfast, a hot cast iron skillet with portabello mushrooms, asparagus, potatoes, Hollandaise, two eggs and cheese. Get a bloody Mary while you’re at it. 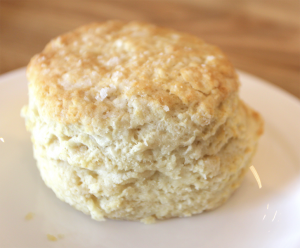 Splendid country breakfasts with loads of fresh biscuits, country ham and the like. Pancakes are sizeable, and chocolate gravy is a favorite. 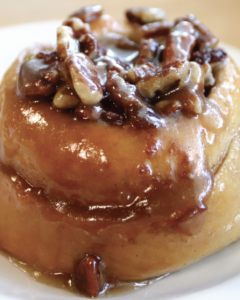 Cinnamon and caramel pecan rolls are delightful specials you should covet when they appear. 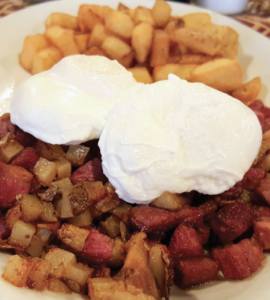 The single best dish of corned beef hash and eggs in the state come from this 99-year-old eatery on Mena Street. 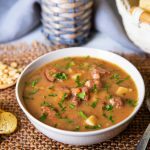 Kielbasa is a local favorite, as are slices of rye toast and fluffy golden hotcakes. The parking lot is always packed at this restaurant just off I-40 and for a good reason. Perfect sausage gravy on biscuits, slabs of ham, loaded hashbrowns and excellent coffee keep patrons returning for relaxed, friendly service. 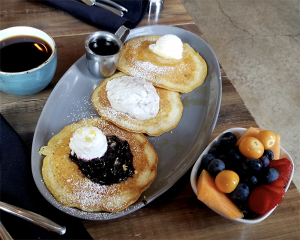 Recently relocated to Caraway Road, this gourmet mainstay has breakfast ready to take with you, from avocado toast to a number of hot and ready breakfast bowls, complete with fresh fruit and baked breakfast bread. 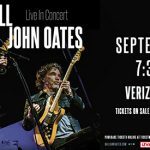 You could just head to the part of the menu that will, as it says, “getcha by.” But then you’d be missing out on the excellent cinnamon rolls, pancakes and omelets – which include the decadent chili cheese omelet complete with onions and, if you wish, jalapenos. The O’Brien potatoes are the only potato option you should consider. 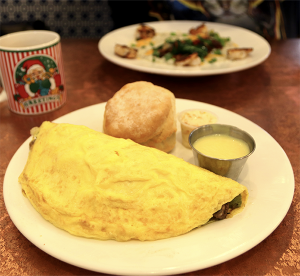 Marvelous omelets and pancakes, including an exuberantly overpacked mushroom cheese omelet. 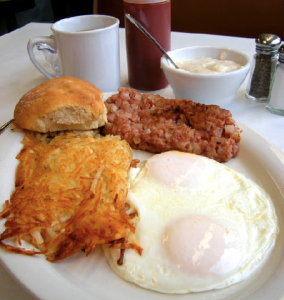 The hamburger steak and eggs are substantial; if chicken fried steak and eggs are on the whiteboard, jump at the chance to enjoy one of the region’s best combinations.